Mark Kislingbury, who can type 360 words per minute on his stenomachine. Kislingbury set the record in 2004, securing his place in the Guinness World Record book as well as his place in history. But Houston, Texas native Kislingbury is not happy to just sit back and relax now that he holds the world record, he told WGNO TV while he was attending the National Court Reporters Association convention in New Orleans recently. There’s still a place for courtroom stenography in the technological revolution by court reporting agency CourtScribes. “I’m going to keep practicing in hopes of breaking my own record. Hopefully in the next few years I can break it by typing 370 or 380 words per minute,” he said. “It is wonderful to hold the record because only a small amount of people have a World Record, and I have one,” he said. Kislingbury, who said he has been a court reporter for 35 years, uses a stenomachine. While he was at the recent convention in New Orleans, he competed in a “real-time” competition in which he had 99 percent accuracy. 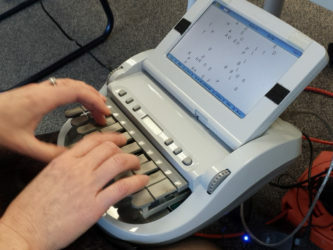 “Using this machine is using shorthand. I make so many shortcuts, it allows me to go faster than most people,” Kislingbury said. He encouraged more people to learn his profession, which is seeing shortages across the United States. Guinness World Records says its mission is to make the amazing official. They seek to inspire people — individuals, families, schools, teams, groups, companies and communities – of any age, in any city or country, to be inspired by reading, watching, listening to and participating in record-breaking. researches, measures, documents and authorizes the world’s superlatives, then creates products that entertain, inform and inspire people through our unique window on the world.